Some creative minds are able to find a way to turn a tree stump into something beautiful. For the rest of us, however, a stump is really just an unsightly distraction from an otherwise tasteful landscape. If you have an ugly stump sitting on your property and acting as a residence for pests, let us remove it for you and spend your time doing other - more exciting - projects. 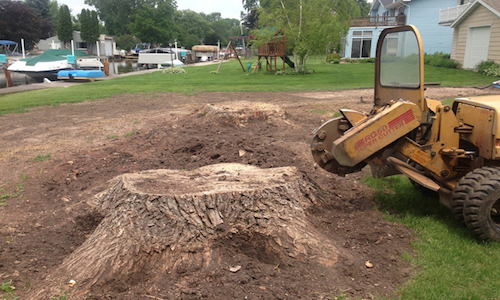 Stump grinding can be a dangerous job and is not something that most home or business owners feel comfortable doing. This is why you see so many yards filled with stumps from trees that were cut down years ago. At Tampa Tree Service, our team is highly experienced in stump grinding and stump removal and it would be our pleasure to eliminate that stubborn tree stump from your property. We know that the complexity of the root system, the species of the tree, the tree’s age, and the location of the stump can make the job a tricky one. Fortunately, we successfully remove stumps of all types, in all situations, every day. A stump can either be physically removed from the ground, roots and all, or ground below the surface and covered with soil and grass. The latter is less harmful to the surrounding landscape and is often the method of choice for homeowners and business owners. Grinding can be a messy job, as it creates a substantial amount of debris and and dust. 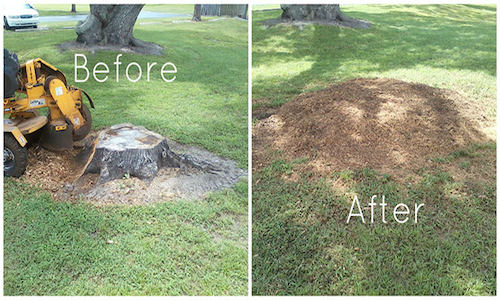 However, as the service for stump grinding Tampa continues to trust, we guarantee diligent tree service and a thorough clean up, leaving your property more beautiful than we found it. On the day of your scheduled service, as our promise, the team will arrive within a guaranteed two hour window. From there, the process is fairly straightforward: we will begin by clearing the area of all debris, using a rake and shovel. We will then use a chainsaw to cut the stump until it is as close to the ground as possible; this reduces the amount of material that needs to be ground. 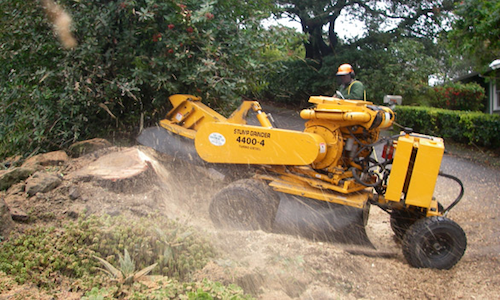 Our high quality Morbark grinder will then be placed over the remaining stump and the cutting blades will be lowered into the wood, which will move back and forth across the entire area of the stump. The process will keep continue until the remainder of the stump is 3 to 6 inches below the surface. All residue - dirt, dust, and wood chips - will then be removed and grass seed or sod can planted to completely restore the area. The length of service varies depending on the size and species of the tree but usually takes between 30 and 90 minutes. Please be aware that this particular service does require heavy machinery. That being said, we choose to use such advanced equipment as the Morbark grinders because they have the littlest possible impact on the landscape. In a few days, there will be no sign that our team - or our equipment - was ever there. If you have more than one stump that needs removing, take advantage of our multi-stump discount. We are proud to be the team for stump grinding Tampa calls!